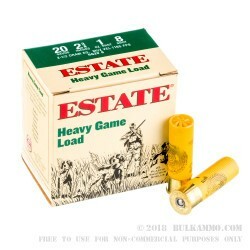 This 20 Gauge shotshell from Estate Cartridge’s Heavy Game Load line of ammunition offers all of the quality features that Estate is known for, including a sturdy plastic hull, clean burning powder that will keep your action and barrel less fouled by residue, reliable and uniform primer, and even patterning wad, but without costing you an arm and a leg in return. That means you’ll be able to bag birds all day without that nagging worry about the cost bothering you! 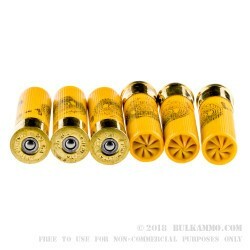 This shell is loaded with one ounce of #8 lead shot -- 410 of the .09” diameter pellets, to be precise. 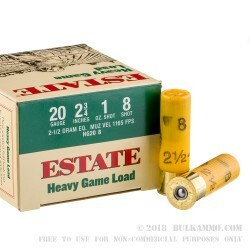 The nice spread at 30 yards that this shot provides is optimal for taking smaller birds like grouse, quail, dove, and woodcock, and its size is enough to drop them without ruining the trophy. 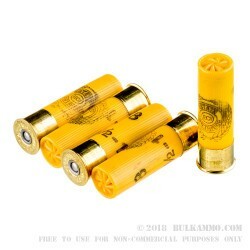 This shot will work well on squirrel and rabbit too, but take caution if you’re going after waterfowl -- their thicker plumage is probably enough to turn these little pellets away, turning your hunting trip into an exasperating adventure in birdwatching -- and bird annoying -- if little more.